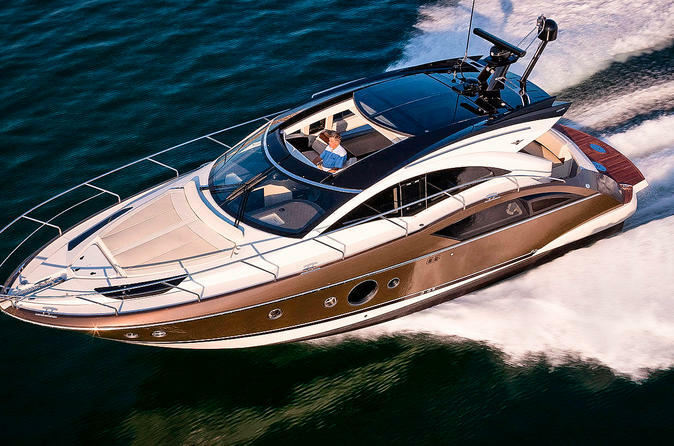 Accommodating up to 10 passengers (in addition to Captain and Mate), the 43 Marquis boat features great styling design that cannot be compared with any boat of its class. Your yacht rental adventure includes tours of Biscayne Bay and the surrounding Miami area. Looking for Luxury Boat Rentals in Miami? Check out 43′ Marquis Boat! The 43 Marquis boat features great styling design that cannot be compared with any boat of its class. It comes with a bench-style backrest helm chair at the corner moldings. It also features bi-folding glass doors with rigid angles that resemble those of the honeycomb. It also has 6’6 degrees by 11’3 degrees retractable sunroof that will let in sunlight. This boat can carry a maximum of 12 passengers and it has two state rooms and one bathroom. But unlike a beehive, the 43 won’t feel cramped, especially in the saloon, thanks to the open, flowing feeling that results from the combination of the 6’6″x 11’3″ retractable sunroof and the aforementioned glass doors. The cockpit holds the real trick feature on the Marquis 43 SC: the sliding transom bulkhead. Just press a button, and the entire aft portion of the cockpit slide back 18 inches, expanding the usable space from approximately 54 square feet to 63 square feet. The swim platform also gets an extension, with a teak overhang that sticks out like a mini pirate’s plank. About 20 square feet of the platform actually rolls aft. Boat Rentals. It's perfect for birthday parties, bachelor/bachelorette parties, sand bar parties, anniversaries, romantic sunset cruises, lunch|dinner cruises, company outings, family reunions, and water sports.